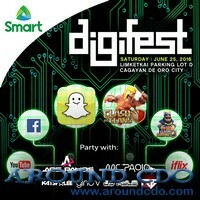 In celebration of its faster and stronger data connectivity in Cagayan de Oro, unrivaled mobile services leader Smart Communications invites all Kagay-anons to one big Digifest party filled with awesome activities, great music and prizes at Limketkai Parking Lot D on Saturday, June 25. A must-not-miss event, Smart’s Digifest features today’s hottest apps in larger than life set-ups powered by Smart’s faster mobile Internet, and gathers some of the country’s top beatmakers led by Smart ambassador and party staple DJ Ace Ramos and MC Pao, Katsy Lee, Gino V, and Banaag Brothers, among many others. To join the celebration, simply load up with Big Bytes 50 if you are a Smart subscriber, or buy a Smart Prepaid LTE SIM and top up with the latest promos if you are a new Smart user. At the event, you can hang out at the different interactive booths showcasing Smart’s faster mobile data in the city: from posting your moments with friends on Snapchat; streaming your favorite videos and series on iflix and YouTube; enjoying your favorite mobile games like Clash Royale and Clash of Clans; immersing in another world with the Samsung Gear VR; to discovering awesome perks and digital content on the new SmartLife app. Throughout the night, all partygoers also get a chance to win brand new Samsung Galaxy S6 handsets and Samsung Gear VR headsets, among other gadgets and premium items. You can also feast on local favorites served by Butcher’s Best; Missy Bonbon, Dear Manok; Simple Joys; Red Tail and Bigby’s, among many others. Amid all the activities and partying, you can make the most of Smart Big Bytes 50, which has now been boosted to offer 2X data – from 350MB to 700MB worth of online surfing plus 600MB for streaming videos and more – valid for three days for only P50. Make sure to post your most awesome Digifest moments using the official hashtags #ConnectNaTa and #SmartDigifest. “With Smart’s recent network improvements in Cagayan de Oro, now’s the best time for Kagay-anons to welcome change with the way they connect and enjoy their favorite mobile videos, music and app – faster and better,” said Kathy C. Carag, VP and Head for Smart Brand and Marketing Communications . As part of its stronger commitment to provide a better digital life for Filipinos, Smart has rolled out network improvements in key cities around the country, including Cagayan de Oro, resulting in much faster and better data experience for Smart subscribers. To showcase this faster and better data connectivity to Kagay-anons, Smart whipped up themed Digifest activities over the past weeks, offering prizes such as free data and gadgets to loyal and new subscribers. The upcoming grand Digifest party comes as a fitting conclusion to this weeks-long showcase of apps like Snapchat, iflix, YouTube, Royale Clash, and Clash of Clans that run perfectly on Smart’s boosted network. For more information on Smart’s upcoming Digifest, follow its official accounts on Facebook (www.facebook.com/SmartCommunications), Twitter and Instagram (@LiveSmart).